I'm just going to say it, Catalyst Prime Superb is simply superb. My first introduction into the superhero imprint of Lion Forge is a thrilling series that is smart, exciting, and very character driven. It's what comic book fans crave, a well-thought-out adventure with heroes you can root for. Ever since a cosmic event gave birth to a new age of superheroes of Catalyst Prime's universe, the people of Youngstown, Ohio have been on edge. Enhanced people have emerged mostly developing in young people and one teen who hadn't learned to control his power caused a deadly explosion at the high school. The Foresight Corporation has been entrusted to contain enhanced individuals and detect them wherever they may be. Its latest detection and capture of a high school student has drawn the attention of costumed vigilante Cosmosis and he's broken into Foresight to rescue her. If it sounds like a lot has happened in three issues you'd be right. It's a fast-paced story but doesn't feel rushed. There's a lot of world-building to do. I haven't even mentioned that Cosmosis is actually teenager Jonah who based his superhero alter-ego on a comic book character of the same name and narrowly escaped Foresight after his failed rescue attempt. He's now on the run with help from his best friend, Kayla, who returned to town because her parents work at the potentially nefarious Foresight. With the technological enhancements from his other friend, the tech genius Abbie, Jonah is capable of some amazing heroics including power blasts from his goggles. David Walker and Sheena C. Howard delivers an exhilarating superhero comic that is as interested in their characters as the action itself. It's hard not to mention that both Jonah and Kayla represent the inclusion that Lion Forge promised with their comic line. Jonah has down syndrome. He's probably the first to be a leading character in a comic, much less a superhero comic. He's portrayed respectfully as a confident heroic figure full of agency. He may be bullied as Jonah but as Cosmosis he's an unstoppable force for good. 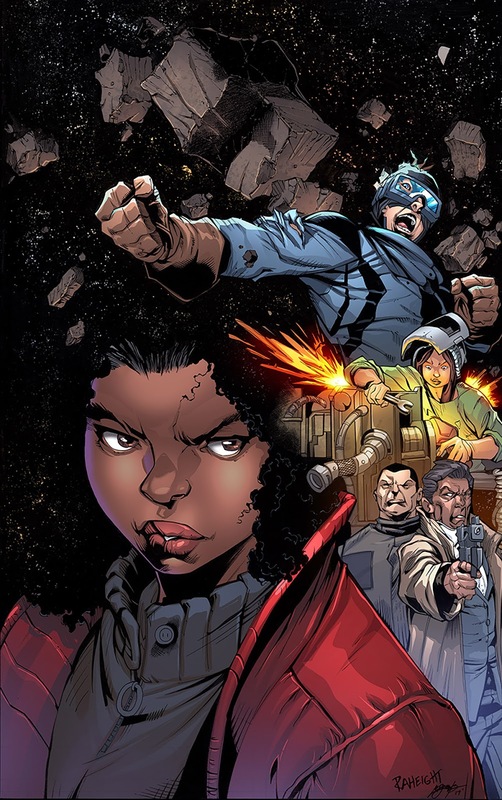 Kayla is one of a growing trend of African-American girls leading a comic book series joining Marvel's RiRi Williams (Invincible Iron Man), Lunella Lafayette (Moon Girl and Devil Dinosaur), and Top Cow's Destiny Ajaye (Genius: Cartel). Kayla's in disbelief to see Jonah risk his life as a costumed hero infiltrating Foresight and she's reluctant to help him return there to save their classmate. Even after meeting his "crime-fighting partner," Abbie who makes gadgets, Kayla is too protective of Jonah to participate. It's a complicated relationship that shapes the dynamics of their friendship amid a perilous rescue mission. create an exciting series of dynamic pages that keep the pace moving without rushing the more emotional sequences. The colors are rich and deep illuminating many of the detailed backgrounds. They ratchet up the tension as the search for Cosmosis goes door-to-door in Jonah's neighborhood and the many cues to his backstory. The art tells the story as much as the words. 'Superb' is as good as any mainstream superhero comic if not more so. It's the inclusive world we've been promised that so far Catalyst Prime has delivered. 'Superb' takes familiar hero tropes and really examines them and their consequences through new characters. Issue three is make-or-break for any comic and 'Superb' makes it with flying colors. It's one of the most satisfying and exciting comics you can buy.